The Center for Digital Intelligence™ @Regalix: Consumer Smartphones or Industrial Grade Smartphones? ﻿﻿One of the interesting things that I have observed in the mobile industry is the differences in perspective between mobile industry veterans coming out of the blue collar and barcode scanning space, and the more recent mobile rookies with a focus on supporting white collar workers and smartphone devices. One of the differences is that veterans coming out of the barcode scanning space seem to appreciate the mobile device and its capabilities as a mobile data collection tool to a greater degree than most rookies in the industry. Having the right mobile devices can in many cases make a big difference in the efficiency of a mobile workforce. Can you read the screen in bright sunlight? Can it withstand daily drops and bumps? Can it fit in the pocket and be ruggedized at the same time? Is the barcode scanner designed for high volume hourly use? Can the device be used in one hand, or does it require two? Can it handle rain, dust and snow? Will the battery last the entire workday? These sensors enable automatic backlighting, screen rotation and precise data geo-tagging. 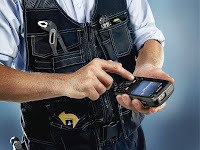 If you are out geo-tagging assets for your SAP EAM system, then you had better be able to use the barcode scanner all day long without running out of batteries, and if working outdoors the barcode scanner had better be bright enough to work satisfactory in the bright sunlight so you don't waste time. Purpose built mobile devices are often the best fit for specific tasks. It doesn't do any good to give a person a device than can't make it through the day completing its intended task. These are all important considerations with looking at productivity in the field. Wouldn't it be sad if a company invested hundreds of thousands of dollars into just the right field services software application to maximize workforce productivity, but then failed to provide the right mobile devices capable of achieving the maximum ROI? Consumer grade smartphones are great, however, for industrial and production purposes you may still find significant value in purpose-built, ruggedized industrial grade mobile devices and smartphones.